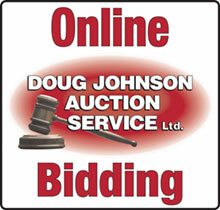 Doug Johnson Auction Service Ltd. (the “Auctioneer”) hereby grants to the party whose signature appears on the bid card (the “Bidder”) the right to use the bid card for the purpose of bidding at an auction sale conducted by the Auctioneer. This right is granted at the Auctioneer’s sole discretion and may be revoked at any time. The Bidder acknowledges that an auction site including parking area, whether on private or public land, is a potentially dangerous place. Any person at the auction site is there at their own risk and should advise their agents, employees and all other accompanying parties of the same. No person shall have any claim against the Auctioneer, their employees or consignors for any injuries sustained, or for damages to, or loss of property which may occur from any cause whatsoever. that all rights and defenses available to Auctioneer hereunder shall extend to the consignor. all times and in all cases of dispute the Auctioneer’s decision shall be final. the sale and satisfy themselves as to condition, age, authenticity, make or model. abandoned, unless other arrangements have been made. said funds will remain available for payment of said cheque upon presentation. agree to comply with and be bound by these terms.